Kevin Mazur/Getty Images for AGAriana Grande stormed Coachella with some surprise guests Sunday night, taking the festival stage with frequent collaborator Nicki Minaj, but also Diddy and Ma$e, and not-so-surprise guests *NSYNC. According to Billboard, Ari kicked things off at 10:39 p.m. by starting “Raindrops (An Angel Cried)” from offstage. She followed that with “God Is A Woman” from Sweetener, and “Bad Idea” from her latest, Thank U, Next. 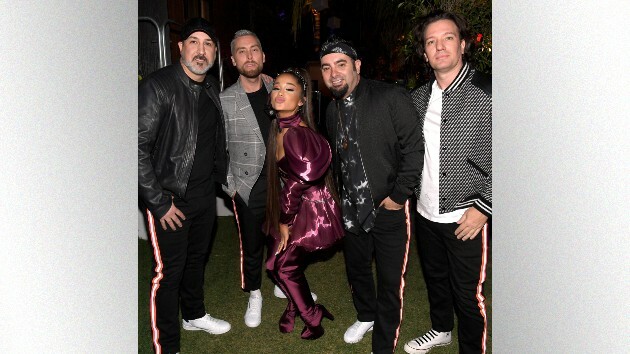 Rumors that Ari could be joined onstage by *NSYNC began swirling next week, because “Break Up With Your Girlfriend, I’m Bored” features a sample from the group — and the rumors turned out to be true. According to the trade, P Diddy and Ma$e also joined Ari for their hit “Mo Money Mo Problems”, with Diddy praising fallen idols B.I.G. and Tupac, as well as Grande’s ex Mac Miller, who died last year of an overdose.